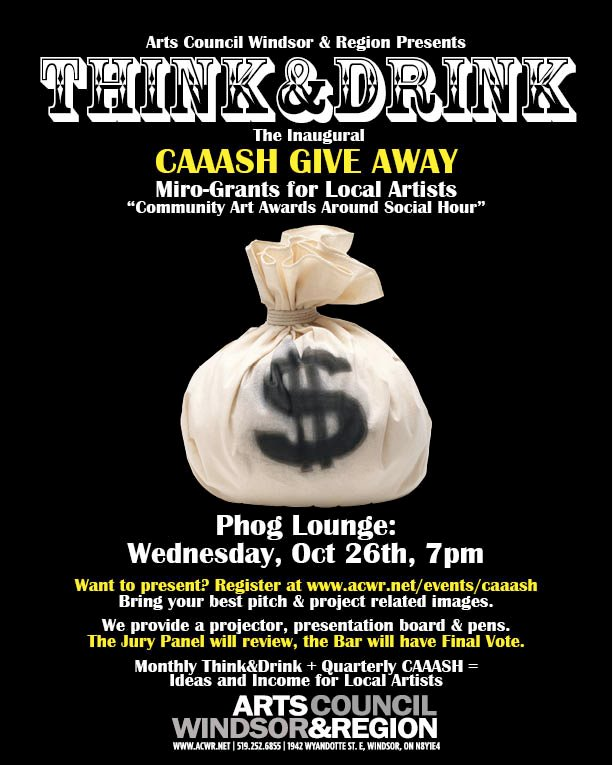 Wednesday, October 26, at Phog Lounge the ACWR will be hosting its first CAAASH Give Away event, with a Micro-Grant of $500! This micro-grant for local artists is the accumulation of Think&Drink donations. Your dollars put to good use! The first 15 people to register will have the opportunity to present their project idea to the Jury Panel, who will create a Short List of 5 Finalists. Those Final 5 present their project idea to the attending public who have final call- Winner Takes All! Bring your best pitch and project images if you have any (sketches, photos, whatever). We will provide a presentation board, pens and projector if you need it. This entry was posted in show promo, Uncategorized and tagged art, Arts Council Windsor & Region, CAAASH, funding, grant, micro-grant, money, Think&Drink. Bookmark the permalink.